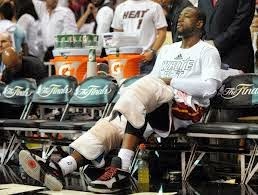 Just like his fellow Heat players, Chris Bosh and LeBron James, Wade can also opt out of his contract this summer. He is bound to make $20.1 million next season, with a whopping amount of $21.6 million in 2015-16. Wade leaving the Heat to make similar amounts of money as a free agent given his age and injury history does not sound viable. If the Heat manages to claim a "Three-Peat" this season, Wade will be winning his career's 4th title, which puts him in a fairly exclusive class, given that only 35 other NBA stars among many have won four or more. Although Wade is already a shoo-in for the NBA Hall of Fame, adding a 4thring to his career will cement the Wade legacy as an all-time great. Wade told ESPN, "That's huge for me at this point." He further added, "Obviously, it doesn't guarantee that you're going to play better the rest of the way. But just having a clear mind when you play this game, this game is just as mental as it is physical. It's probably more mental than physical. So when you can go in with a clear mind mentally, feeling good up here (points to his head), and you're obviously feeling good physically, then you know you're capable of doing whatever your talents can bring."